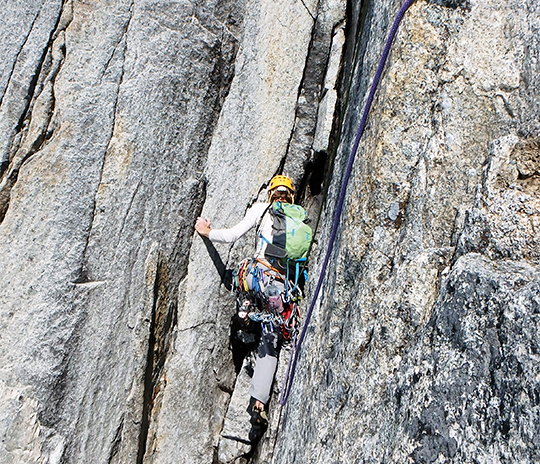 On May 19, one day after arriving in Alaska's Coast Mountains, Max Fisher (Canadian) and I (American) climbed the first of two new routes, one on Kooshdakhaa Spire, ca. 7,500 feet, and the other on an unnamed 7,000-foot peak, located over a glacial pass. 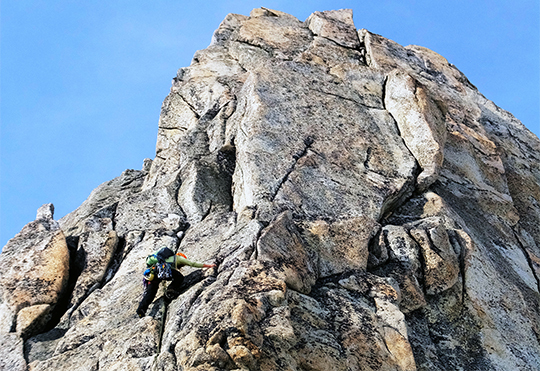 William Wacker, a southeastern Alaskan climber, asserted in the 2013 American Alpine Journal that "most of the mountains surrounding Haines are geologically not good to climb without snow on them." In other words, the Coast Mountains are known for poor rock quality. However, Wacker conceded that there are exceptions. 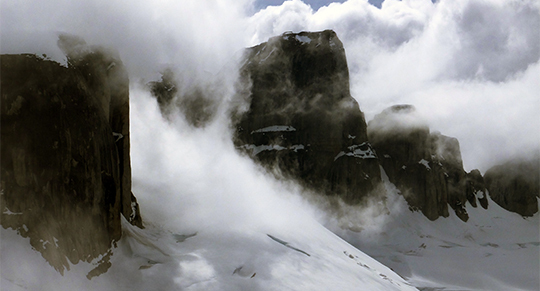 In my opinion, Kooshdakhaa Spire and the unnamed peak are such exceptions and contain quality climbing. 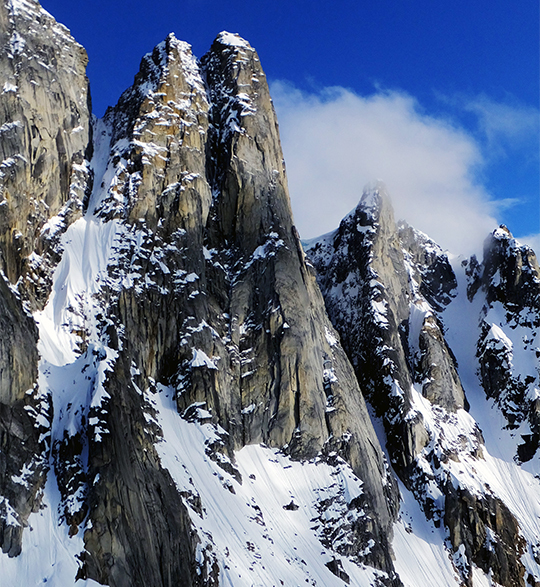 The Kooshdakhaa group of peaks is located about seven miles west of 7,127-foot Mt. Foster, a mountain on the border between Canada and the United States. At the southern edge of the group, Kooshdakhaa Spire rises more than 2,000 feet above a hanging tributary of the Chilkat Glacier. 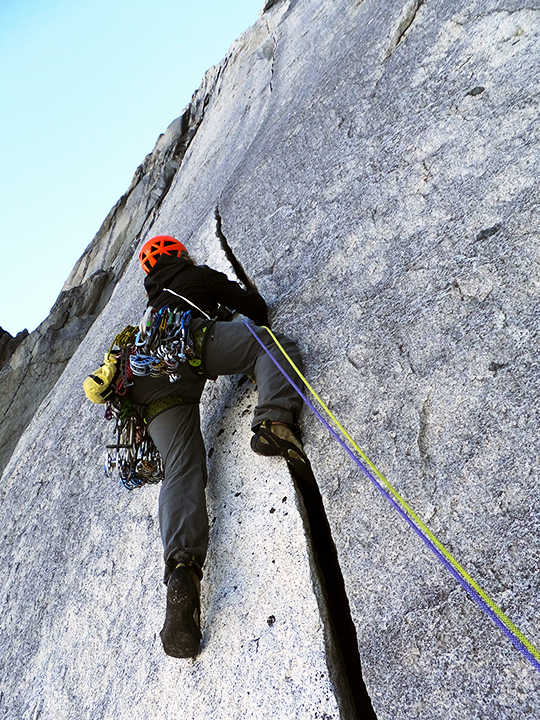 Fisher first spotted the spire in 2013 when he was leading a NOLS expedition in a nearby valley and snapped a picture of the clean buttress feature. "It looked steep; eighty degrees at least, maybe vertical," he told me. A year later, in 2014, and with support from a Copp-Dash Award, Fisher and I visited the area for the first time. After we made the first ascent of Kooshdakhaa Spire, ca. 7,500 feet, via a moderate snow, ice and rock route, we made two attempts on a steeper, more challenging line but retreated seven pitches up. Though the route we attempted contained sections of imperfect rock, it also had a 300-foot hand crack splitting through two roofs. On May 19 of this year, Fisher and I rapidly ascended to our previous high point on Kooshdakhaa Spire. From there, I jammed an offwidth roof crack and gained access to the steeper crack systems above. From bergshrund to summit, we were on the wall for 33 hours, climbing fourteen pitches of 5.10 to 5.11 with some aid. Fisher and I called the route Otter Water Boogie Man (5.11- A1, 2,000'), a loose translation of the word Kooshdakhaa. In the mythology of the Tlingit and Tsimshian native people of southeastern Alaska, a Kooshdakhaa is a shape shifter that lured fisherman to their deaths, though at other times it saved the lost from perishing from the cold. The name represents the range of experiences we encountered on the spire, from shivering to sunshine to storms to splitter cracks. As the weather held stable, Fisher and I moved across the Canadian border and over a pass to the valley that Anderson's group had previously explored. There we found good rock across from ca. 7,800-foot Castle Grayskull/Kooshdakhaa E4 and climbed a new route, Lichening Bolt Buttress (5.11-, 1,300'), on the unnamed 7,000-foot peak. Our route ascends aprons and crack systems with mostly moderate climbing but with a few 5.10 and 5.11- cruxes. During both expeditions, Fisher and I arrived by airplane and returned to civilization by packraft.